07:44 AM - -Karasu mentioned Qoco in post Re: Hello. 06:21 PM - -Karasu mentioned hereiamkirt in post Re: Well, hello! 01:44 PM - -Karasu quoted Anime Forum in post Re: Has any anime ever scared you? 01:29 AM - Qoco quoted -Karasu in post Re: Hello. 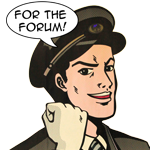 07:01 PM - -Karasu quoted Anime Forum in post Re: Secure or Insecure?